Spudguns, I just sat here typing out a rant and decided against posting it. I am finding myself doing that more often lately then I ever thought I would. Writing up a blog post and shelving it. Let's talk about the Fool for a few minutes shall we. I mean the tarot not me right now. 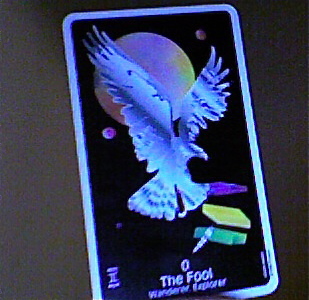 The card shown here is from the Crow Magic deck. Depending on what deck you are using, the Fool is either numbered 0 or 22. It's the first card normally in the Major Arcana and represents beginnings, blind faith, trendsetting, naivete, innocence, purity, and freedom. It's also connected to the zodiacs of Aquarius, Gemini and Libra. And you're asking, why are we chatting about the Fool card? Because Spudgun, it's been popping up at me for the last few weeks. And you know how that goes, when I am being haunted by a card, I need to talk about it. Though in this case, as in most cases, I have no idea what it's trying to yammer at me about? Do I need to be starting something? Having more faith in something/someone? Starting a trend? Totally clueless here. I'm done fighting. I'm tired of the way things have turned out.